The song was largely written during a recording session at Abbey Road Studios on 18 September 1968 by John Lennon and Paul McCartney. 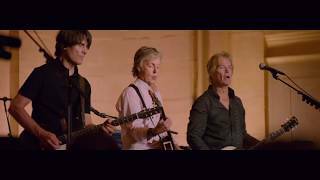 McCartney: “We thought, ‘Why not make something up?’ So we got a riff going and arranged it around this riff. So that is 50-50 John and me, made up on the spot and recorded all in the same evening.” During the session, the Beatles and the recording crew made a short trip around the corner to McCartney’s house to watch the 1956 rock & roll movie The Girl Can’t Help It which was being shown for the first time on British television. After the movie they returned to record “Birthday“. George Martin was away so his assistant Chris Thomas produced the session. 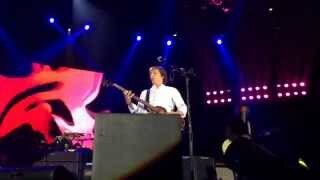 His memory is that the song was mostly Paul’s: “Paul was the first one in, and he was playing the ‘Birthday’ riff. Eventually the others arrived, by which time Paul had literally written the song, right there in the studio.” Everyone in the studio sang in the chorus and it was 5 am by the time the final mono mix was completed. 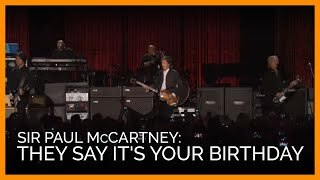 “Birthday” begins with an intro drum fill, then moves directly into a blues progression in A (in the form of a guitar riff doubled by the bass) with McCartney singing at the top of his chest voice with Lennon on a lower harmony. After this section, a drum break lasting eight measures brings the song into the middle section, which rests entirely on the dominant. A repeat of the blues progression/guitar riff instrumental section, augmented by piano brings the song into a bridge before returning to a repeat of the first vocal section, this time with the piano accompaniment. We thought, ‘Why not make something up?’ So we got a riff going and arranged it around this riff. We said, ‘We’ll go to there for a few bars, then we’ll do this for a few bars.’ We added some lyrics, then we got the friends who were there to join in on the chorus. So that is 50-50 John and me, made up on the spot and recorded all on the same evening. I don’t recall it being anybody’s birthday in particular but it might have been, but the other reason for doing it is that, if you have a song that refers to Christmas or a birthday, it adds to the life of the song, if it’s a good song, because people will pull it out on birthday shows, so I think there was a little bit of that at the back of our minds. [a] mono 18 Sep 1968. The last “daaaance” starts twice, maybe a double-track error or a leak from a guide vocal, as heard on stereo [b], but covered up by other sound in [a]. “Birthday” has been played in 120 concerts and 16 soundchecks.